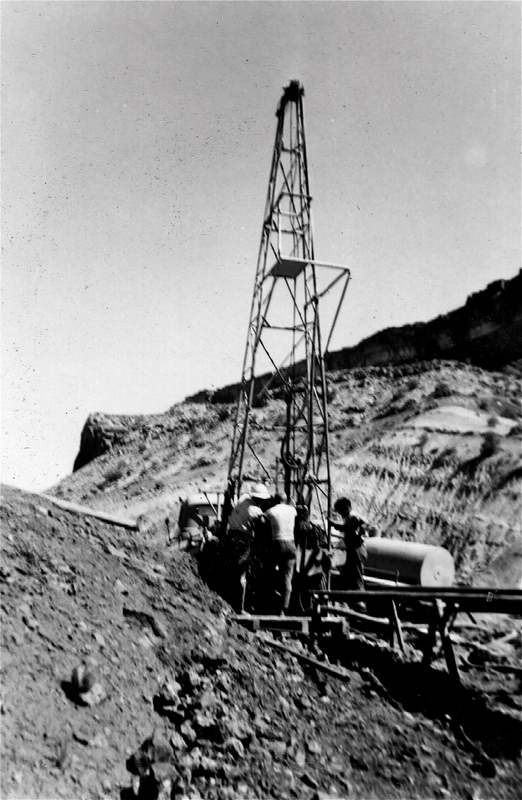 A drilling rig at Four Aces Claim in August 1955 with the sloping Chinle shale mostly hiding the tall Wingate cliffs of Copper Point. (Most crews had one driller often in his 20s and two teenage kids. The latter often liked to shoot at the common, tiny (6 to 10 inches long and under 1/2 inch diameter) sidewinders. Since we all wore boots this shooting was much more dangerous (bullets fly off rocks in surprising directions) than the snakes themselves. They are only dangerous when you sleep on the ground. They may slide into your sleeping bag to escape the cold desert nights and if you role over a bite in the wrong place could easily be fatal. Most of the summer there were two of us living in the Four Aces tunnel and supervising hired drilling crews from other small companies. We were trying to follow the Shinarump ancient river channel as it meandered under the sloping, and thus increasingly thick Shinle shale. That night the drilling crew guessed they would finish a 250 foot deep hole about 3:00 am so I bedded down next to the drill site. When they had pulled most of the drill stem they waked me up so I could calibrate the scintillation counter. It would not turn on! Inspection showed that a solder joint between the counter itself and the 500 foot cable had broken. Because the drilling company had only a single string of casing pipe they could not move until I had measured the radiation. At Fry Canyon about five miles away there was a tiny settlement and I felt pretty sure that when people there woke up, there would be someone able to re-solder the joint. If not, it was more than a three hour drive to the nearest town, Blanding, Utah. Thus the drilling company would charge my company a minimum of $500 to possibly well over $1,000. I remembered seeing a discard lead-acid car battery on the side of the road only a few miles away. I convinced the drillers to take a 1.5 hour lunch break before beginning to charge down time. I sped off in my jeep to find the old battery. I was not sure my headlights would illuminate it in the dark, but they did. I chopped it open, took out a few lead plates and drove back up the tricky back-up switchback on the Moenkopi cliffs to the Four Aces tunnel. I melted the lead in an old tuna fish can on our propane stove. Solder is a mixture of about 60% tin and 40% lead with a melting point around 185 degrees whereas pure lead melts at 327 degrees. Even with solder one usually needs flux to make a joint. I had already thought of this. Our old tunnel had been re-timbered with pine logs. Where they were bruised oily sap had accumulated which made an excellent flux. Because of the high temperature of the melted lead, it took several attempts to make a good solder joint. However, within 1.5 hours I had counted the radioactivity of the hole, the drilling company had pulled their casing and moved on to the next drill site without charging my company a penny for down time. I went back to sleep feeling that I had earned the money I would charge for my night time work. Human beings were evolved to be resourceful and deal with dozens of different kinds of challenges every day. For the past few thousand years more and more of us have been assigned to specialized expert jobs. We may face challenging and interesting problems, but they tend to be more and more the same kind day after day. Thus I found prospecting at least as satisfying as the many jobs I have had since then. If you know me, you know I have always managed to do several different kinds of work every day.